Different range, same deal: windy, cold, short. 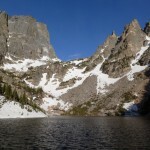 My original plan was to climb the Dragon’s Tooth couloir on Flattop, then circle around over Hallett and Otis before returning to Bear Lake via the Andrews Glacier. 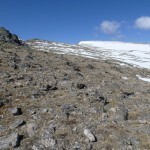 However, the Dragon’s Tooth is badly melted out, and bitterly cold wind on the plateau dissuaded me from making the long trek to Otis. 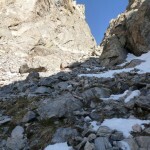 The north-facing couloirs look like they’re in season, but the south-facing ones are pretty much toast. The Park Service is tearing up the road to Bear Lake again, so it took about a half hour to drive from my National Forest hiding spot to the trailhead. I prefer to sleep at trailheads, but I gather that RMNP is pretty strict about forbidding this, and I haven’t found a closer legal spot. 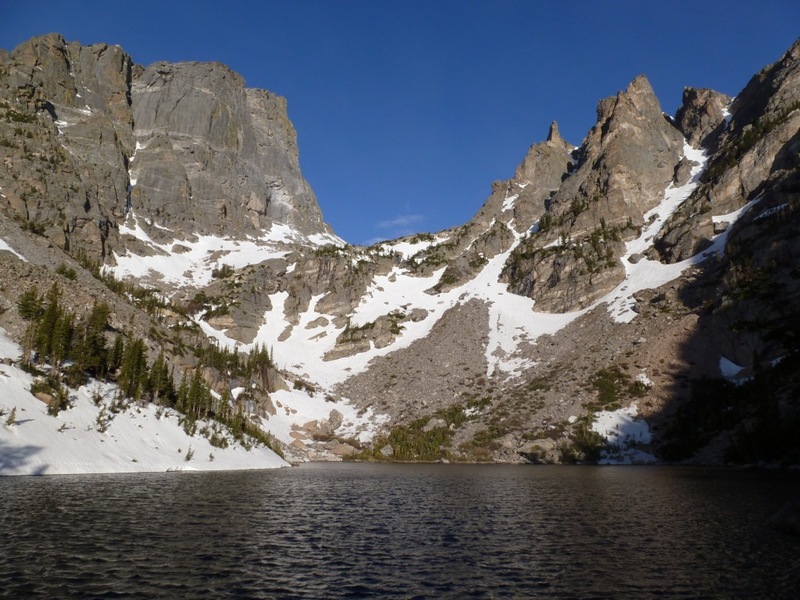 Since it was windy even in the valley, I knew I was in for some suffering, but I still got started a bit after 6, cruising the partly-paved trail to Emerald Lake. 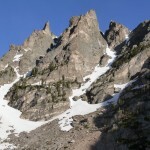 After a bushwhack around the north side, I put on my crampons at the base of the snow apron and started up the Dragon’s Tooth. 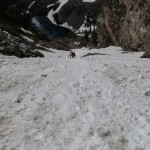 It was an easy snow cruise, but as I rounded the corner into the couloir, I saw plenty of bare dirt and rock higher up. Having already gained so much elevation, I decided to try and finish it dry, stowing my crampons and axe. The rubble was annoying but not difficult; what stopped me was the huge chockstone. I almost made it around the left side, mantling up onto a sloping ledge by yarding on a huge positive hold, but I wasn’t feeling the next move from the ledge onto the sloping chockstone. Thwarted! 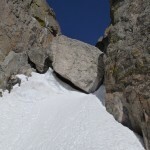 Once I got down the rubble, the bottom of the couloir was actually a fun boot-ski. I was debating whether or not to try the neighboring Dragon’s Tail, which looked mostly filled-in on the approach, and seeing two climbers starting up, I decided to go for it. This late in the day, the snow was almost — but not quite — soft enough to just kick steps. 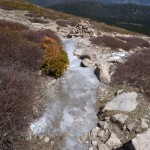 I caught and passed the two others, then followed a nice boot-pack up the moderate snow slope. 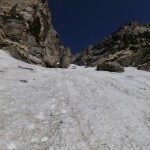 The snow ended maybe 100 yards below the rim, so after an awkward exit, I once again stowed crampons and axe, then almost wished I hadn’t while crossing some wind-hardened snow near the rim. I wisely prepared for the wind safely below the summit plateau; there is no shelter to be found, and the wind was strong enough to make changing clothes awkward. It’s a long trek to Flattop’s “summit”, and there’s nothing to see there other than a hitching post and a trail junction. I met two young guys on their way back from Hallett, who told me that the wind was even worse there. I was fine with the wind so far, and still planned to go on to Otis. 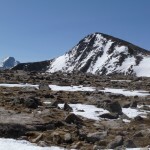 But they were right — the wind got much worse crossing the saddle above Tyndall Glacier, and did not relent on the climb up Hallett. I looked at the long, rocky traverse to Otis while thawing my right eyeball on Hallett’s summit, and decided to call it a day. I managed to freeze my hands a bit on the way back to Flattop, where I met two men who told me that Flattop’s north-side couloirs were still in good shape. 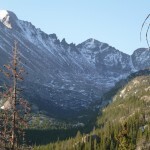 This is one of the park’s most popular trails, so I met several parties on the way down, including one couple planning to ski the Tyndall glacier. The trail through the trees is still mostly buried in drifts of snow/ice/slush, but there was fortunately a clear bootpack to follow. And swarms of tourists near the trailhead, enjoying the last of their Memorial Day weekend. Tip: Kind Coffee in Estes Park is a good place to hang out. It’s cheaper and more spacious than the neighboring Starbucks, and the employees are friendly. One even washed my nasty breakfast mug without my asking, so my coffee will taste better for a few days.